If necessary, unlock the stowage compartment. The stowage compartment is locked when the key slot is vertical. To open, pull up the opening lever . To close, push the cover up. The stowage compartment on the front passenger side is intended for the vehicle wallet. The vehicle wallet should always be kept in this compartment. 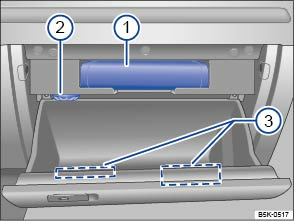 Depending on the vehicle equipment level, you may find a separate vehicle wallet compartment in the upper region of the luggage compartment . The upper area of the stowage compartment may contain infotainment system devices and card readers ⇒ BookletRadio, or ⇒ BookletNavigation system, . A vent in the upper area of the stowage compartment can be used to feed cooled air into the stowage compartment when the air conditioning is switched on. Turn the vents to open and close them. The stowage compartment cover may contain a coin holder and a mounting for a glasses compartment . An open stowage compartment on the front passenger side can increase the risk of serious injury in the event of an accident or during sudden braking or driving manoeuvres. Always keep the stowage compartment closed while the vehicle is in motion. 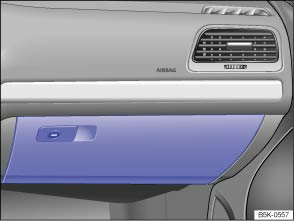 In some vehicle models, the stowage compartment on the front passenger side contains apertures, for example behind the vehicle wallet compartment. Small items can fall through the apertures and become trapped behind the trim. This could cause unusual noises and damage to the vehicle. For this reason do not store small items in the stowage compartment.